When I purchased the business in 1997, my aim was to make vehicle servicing affordable to the average person. I introduced free courtesy vehicles for clients to use (just pay for petrol used) and have updated them regularly. Nothing comes “cheap” and we have all once regretted buying “something cheap and nasty” At Vehicle Service Centre, we don’t do cheap – we do affordable and you get a proper job – with a 12 month guarantee on all work carried out. We buy quality, aftermarket and genuine parts and can even source quality secondhand parts or rebuild products to make the job more affordable. I generally get three supplier quotes for most jobs. We pride ourselves on carrying out a good service for a fair price. Many people say “you only get what you pay for, but only pay for what you get” this can be the case, but we take every job on its merits and won’t fix an older car that’s not worth fixing. I have planned equipment upgrades over the years and have invested in a Scan Diagnostics Tool, Brake Drum/Disc Lathe and BM Autoteknik Brake Roller Machine. All of these tools are invaluable in early diagnosis of a problem that might exist, before it becomes a major expense. I allow you to talk to the Technician who worked on your car if you require and think communication is a major part in a customers relationship with us. A Courtesy Car is available for your convenience, just pay for petrol used. Only available for same day repairs and services. Bookings essential. We offer a free breakdown service to clients who have their car Serviced and WoF with us - provided they are within the service period and within a 10km radius of our workshop and not outside our normal work hours. We will tow you in or if after hours, arrange a tow truck to collect and bring to our workshop for checking and/or repair (tow truck fees applies in these cases). Courtesy Vehicles are available (we have three) for short or long term use, provided the driver is over 25 years old. A copy of your driver licence is required for insurance purposes. A receipt for petrol upon return is also required for proof of topping up with petrol. We offer a free pick up and/or drop off service for if a courtesy car isn’t available isn’t available at the time of booking. 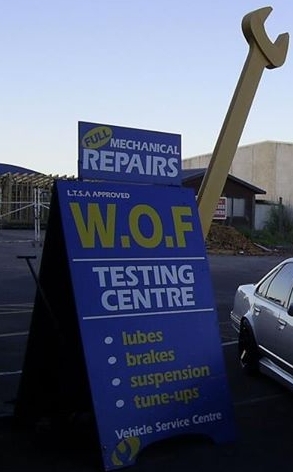 For the past 10 years we have offered a half price WoF check with every Full Service carried out by us, saving you over $25. We also offer $5 off our repeat clients for a WoF if the service is not due. We have for past 18 years sent a WoF reminder card, text or e-mail options to have you return for a check and offer a $5 off your normal price for repeat clients. We feel with the 12 month WoF checks, that it’s too long between visits. To have your car checked. We offer for $25 an “inbetween” service check. We check and pump your tyres, check your oil and filter fluids for that “peace of mind” that your vehicle is running smoothly. We also offer a tyre rotation service for a small fee of $15. A small fee may apply for this service. © Copyright 2016 Vehicle Service Centre. All rights reserved.